Science as a destiny: Graduation! 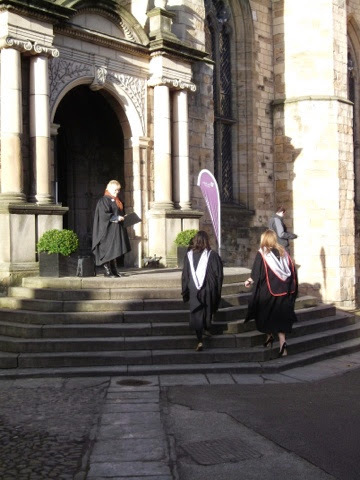 Last week felt like stepping back in time as I made a return pilgrimage to Durham to collect my undergraduate Degree ( BSc in cell Biology). Technically. I should have graduated last summer, however I had decided to defer the ceremony as it clashed with my media internship with the Society for Experimental Biology. Although it was numbingly cold, we were fortunate with the weather and the world heritage site was bathed in winter sunshine. Whilst queuing up in our 'pairs', we did a few Mexican waves to try and warm up a little! As we processed from the Castle to the Cathedral, the scene was a curious juxtaposition of technology; above the ancient Norman shrine of St Cuthbert, fashioned with medieval technology, a modern drone whizzed up and down in the sky, capturing the scenes for the souvenir DVD. But that is all in the future - before that , the thesis itself needs to be written and for that I need some data! So it is back to Sheffield and to my plants. But it was lovely to take a pause and reflect on how far I have already come. 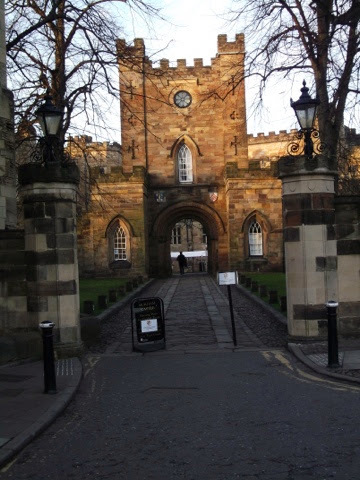 It was also very nice to meet up with some of the Academics of Durham Biological Sciences Department who had been real mentors to me. 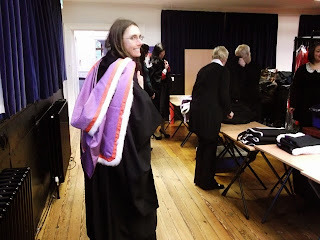 It felt a shame to take the gorgeous robes off but I am fortunate in having a fascinating subject to return to work on... And a dream of a second graduation to come!